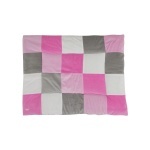 Elevate your child's comfort quotient with this quilt. It is made of a luscious material and feature adequate dimensions that ensure proper ease. The chequered pattern in an alluring colour combination makes it attractive.